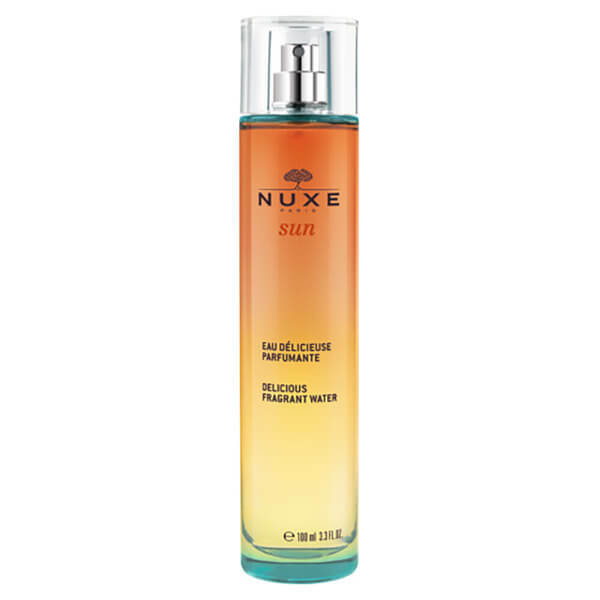 NUXE Delicious Fragrance Water is summer in a bottle. The versatile mist can be used on skin and hair to energise and brighten the senses. Infused with a blend of ripe, exotic notes, including Sweet Orange, Petitgrain, Coconut, Tiare Flowers, Vanilla and Musk, it creates an unmistakable summer scent. Simply spritz onto skin, or mist onto your hair brush and comb through your tresses to infuse hair with its delectable scent. Contains at least 85.6% of natural origin ingredients. Spray a hint of Delicious Fragrant Water then walk through it to be fully “dressed” in its scent. This mist will leave a lovely summer scent to your clothes. For an even more delicate effect, spray your hair brush. When you brush your hair, the fragrance will envelop your hair. Alcohol Denat., Parfum/Fragrance, Aqua/Water, Eichhornia Crassipes Extract, Glycerin, Fagraea Berteroana Flower Extract Limonene, Benzyl Salicylate, Linalool, Citronellol, Geraniol, Benzyl Alcohol, Citral, Coumarin [N2612/A].